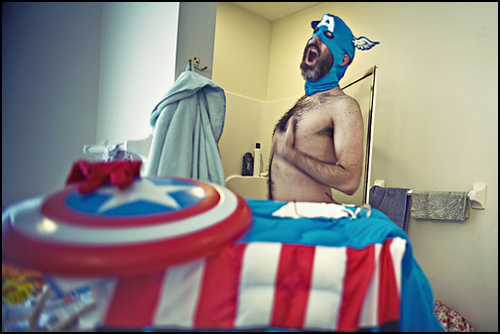 And I Am Not Lying » Blog Archive » Captain America Brushes His Teeth With Whiskey. 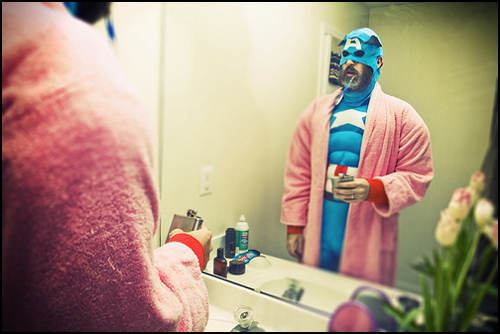 Captain America Brushes His Teeth With Whiskey. It’s a tough time for Captain America. Advances in military technology have made a jacked-up dude with discus skills all but obsolete on the battlefield, the current U.S. administration is one that ol’ Steve Rogers might not be too stoked to shill for, and his rumored cameo in the Louis Leterrier / Ed Norton Incredible Hulk film was cut. And he was also assassinated last year, which will put anyone out of sorts. So until the upcoming Avengers movie gives Cap something worthwhile to do, we’re just going to assume that he’s sitting around his apartment in his robe and Al Gore post-2004 election beard, swigging the fire water and staring longingly at a picture of the Red Skull in front of the TV. 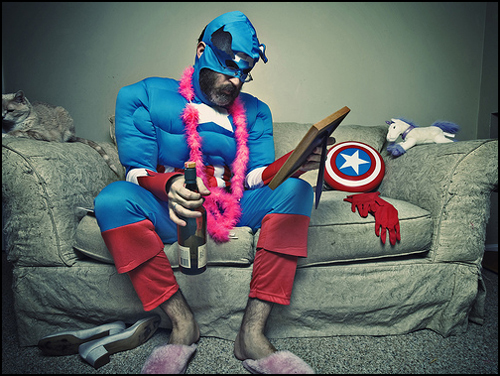 Paul Armstrong‘s photos of a retired-but-still-hanging-on-to-it Captain America do a great job of depicting that sort of sadlarious ennui. Maybe he’s doing some freelance work here and there, protecting freedom from home part-time or something… ’cause this is pretty much what my days looked like when I was freelancing last summer. He just has cooler pajamas that he stays in until 2pm when he realizes that he needs to go buy milk if he’s gonna make macaroni and cheese. The best price for generic Levitra HowMed website http://howmed.net/order-levitra-vardenafil/, check for yourself.